I made this cake ever so long ago and really have no excuse for not posting it up until now. I love desserts with citrus fruit and especially more so if it is lemon. What I like about this cake is that it uses different texture of flour. The cornmeal gives the cake crumbs a nutty taste quite akin to a semolina (sugee) cake. However if you don't have semolina or cornmeal, you can use self raising flour instead. It will end up tasting more like a citrus butter cake then. The other thing I like about this recipe is that it has a lemon curd that is baked with the cake batter. You would usually think of using lemon curd as a frosting in between layers or on top of the cake. 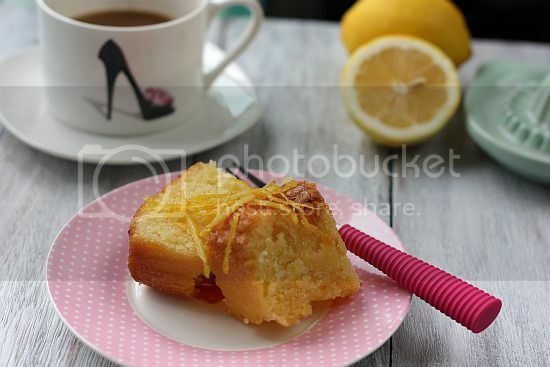 Lastly, it has a lemon drizzle to top it off. This recipe truly is one for lemon dessert lovers. It is great for a afternoon tea and serve this with English tea, I think it goes so well with it. 1) Heat oven to 180C, middle rack. Butter a rectangular tray 20cm x 30cm, line the bottom with parchment paper. 3) Spoon the lemon curd over the batter in thick stripes. Use the handle of a spoon to swirl the curd into the cake. Do not over-swirl as you don't want to mix the curd into the batter, otherwise you do not see the swirls once the cake is baked. 4) Bake for 35 minutes or until golden and risen. The sides will shrink away from the pan slighly and the top will feel springy. Don't open the oven before 30 minutes of baking is up. 5) Leave cake to cook for about 15 minutes before turning out of pan. Place cake on a wire rack. 6) To make the drizzle, mix the sugar and lemon juice together. 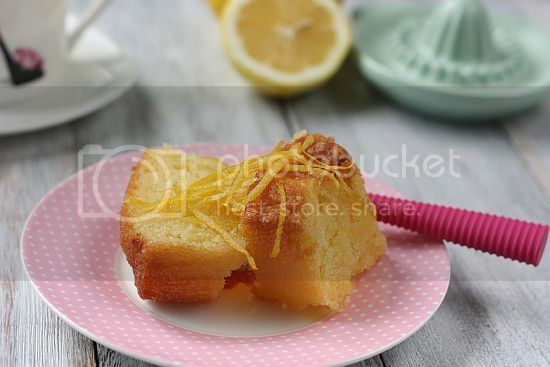 Then spoon over the cake> Toss the lemon zest with the final tablespoon of sugar and scatter over the cake. Let cool completely and then place cake onto a serving plate, peel away the parchment to serve. Cake can be kept in room temperature in airtight tin for 3 days. Like you, I enjoy citrus flavoured cakes too. Love the fine crumbs of this cake. heheh... expected to see that lovely vegetable fritters here and was greeted by this gorgeous cake. Thanks for having us over. I think you may want to get a facebook icon to your site. I just bookmarked the url, however I had to do it manually. Simply my 2 cents. I'm not one who would go for citrus flavored bakes, not because I dont like but it's mainly the food our parents feed us since young.. But this cake sounds and look too appetizing that I'd love to give it a go one day! Have bookmark the recipe! 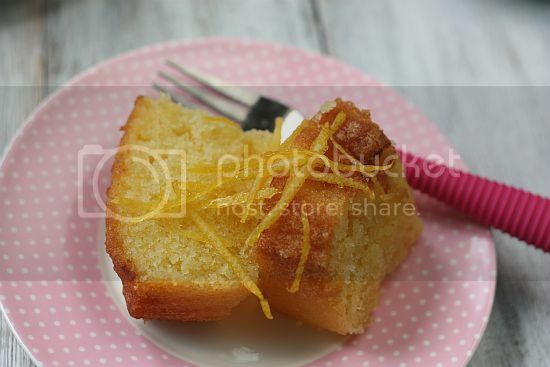 I adore the citrus cakes...this looks light and enticing. Hi Shirley, not only does it have fine crumbs, it is a very moist cake as well. Keeps well even after a few days. Hi Edith, you are most welcome and it was an enjoyable get-together. Btw the recipe for the fritters is actually an old post already. I also loved your chee kueh - not sure if the recipe is up on your blog or not. Would love to try it out. Hi Aimei, let me know how it turns out when you do try out the recipe. Hi Angie, yes it is light, totally lemony!